We all have daily deal e-mails that come at us every day. I barely even look at most of them anymore, sending them straight to my trash because, honestly, I can count on one hand the number of times I have actually seen something one of the e-mails that actually pertains to me. And most of them had the same kind of deals, for either vacations I could not afford, or spa treatments I did not want. Now along comes AppGratis to shake up what has become a mundane and, frankly, declining industry by offering people something unique: instead of sending subscribers deals for products, they send them daily deals for apps. If that sounds like an interesting idea to you, it did to investors as well, since AppGratis has raised $13.5 million in Series A funding, it was announced Thursday. The round was led by Iris Capital, a leading pan-European venture capital investor that specializes in digital economy, with participation from the Orange Publicis Fund. Founded in 2009, AppGratis was profitable from the beginning, Simon Dawlat, founder of AppGratis, said in an interview with VatorNews, but the company decided to take money now so that it could grow quicker internationally. The app launched in the U.S. in December. In addition to its global expansion, the money will also be used to scale the company, ramping the product and for expanding the team. The company plans to hire 35 to 40 new people in the engineering, content curation, marketing and sales divisions, doubling the current number of 40 employees. The company currently has employees from twelve different nations. Based in Paris, France, AppGratis started out as a daily newsletter that Dawlat shared with his friends and has since expanded into an app discovery service that sends out daily emails to users with recommendations for apps they might like. Users have access to apps on both iOS and Android. Users on iOS will be redirected to the app store to purchase the app, while Android apps are hosted on the service and can be downloaded directly. While the technology behind recommending the apps is not perfect, Dawlat says, they become more precise with more usage. The more a person uses AppGratis, the better idea the service will have as to what apps they would like best based on download patters, and data gathered. What sets AppGratis apart from other similar services, Dawlat said, is that he strives to make the service simple, as opposed to other services that make finding the right app too complex. In addition, Dawlat takes what he called "an editorial approach," meaning that the apps are shipped with a blurb, either a short story or a joke, to make the process more enjoyable. The company makes money in two different ways: first, by teaming up with advertisers. For example, AppGratis is teaming up with Nike to offer the Nike Plus app, which is usually a paid app, for free. The app will be featured, and Nike will pay AppGratis per download for the exposure. AppGratis also makes money from revenuesharing, charging independent developers on an install basis. The company currently averages over $1 million in monthly revenue. AppGratis is available for iPad and iPhone in 11 languages, in over 120 countries. The app has 7 million users in over 30 countries, with two million daily active users and over 300,000 new users per day worldwide, and half of those are in the United States, according to Dawlat. The app service is ranked in the Top 10 overall in the U.S., #2 in the UK and is ranked in the Top 10 in over 30 countries worldwide. 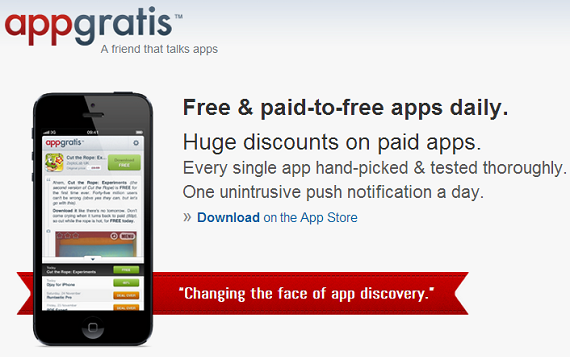 AppGratis delivered over 100 million referral clicks to the AppStore last year. Using a unique editorial approach, we deliver one hand-picked app deal every day. Our users are alerted via a single unintrusive push notification. AppGratis is all about discovering and giving visibility to the best apps the App Store has to offer.